What we have here is Osaka and Sakaki from the excellent 4koma and anime Azumanga Daioh by Kiyohiko Azuma. The 4 paneled manga was released from 1999 through 2002 and an anime of the same name aired during 2002. If you’ve never heard of Azumanga, you’ve probably been living under an anime rock (what are those like?). Anyway, the manga is probably better than the anime, but both are great xD. Kotobukiya has released the first two Azumanga girls from their Legend Girls series, Osaka and Sakaki. Let’s start with Ayumi “Osaka” Kasuga ^^. Osaka has an optional water float that you can put around her. Her legs are removable and must be taken off to put the float on. Sadly, however, the build quality of these two figures is a bit lacking. Osaka, for example, does not really fit her water float. When I tried to attach it, her arm and hand do not rest where they should. 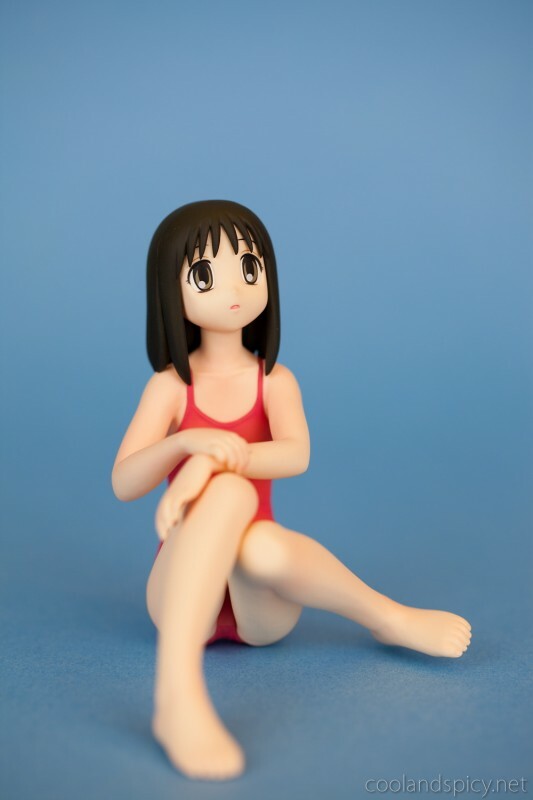 Instead you get a big gap between her hand and her leg, when her hand should be resting comfortable on her knee. Also, Osaka in general is not balanced correctly. With or without her float, she does not sit level on both legs. Her right extended leg is lower and causes her other leg to hang a bit above the surface on which she is placed. Also, when you put her float on, her legs don’t give enough room for the float and as a result don’t fit entirely back into their sockets, leaving a small seam. Sakaki also has some problems. 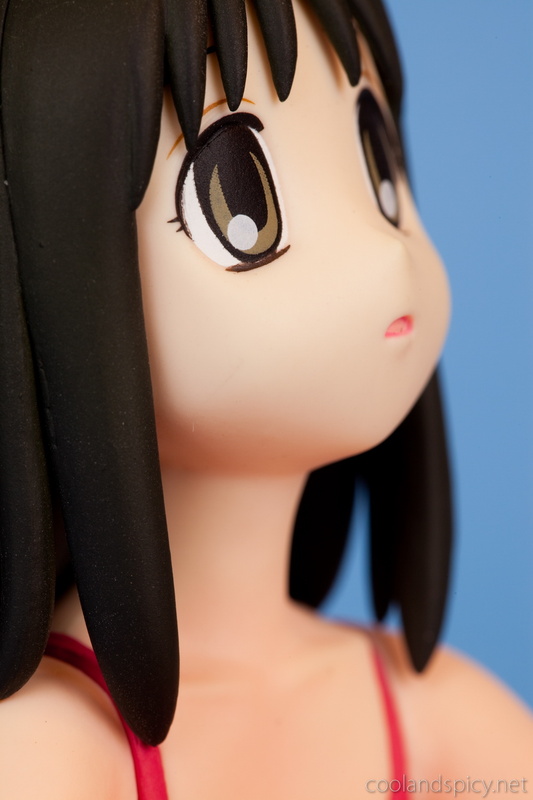 While she does lay level on a surface, the molding quality (or lack thereof) seems more apparent. 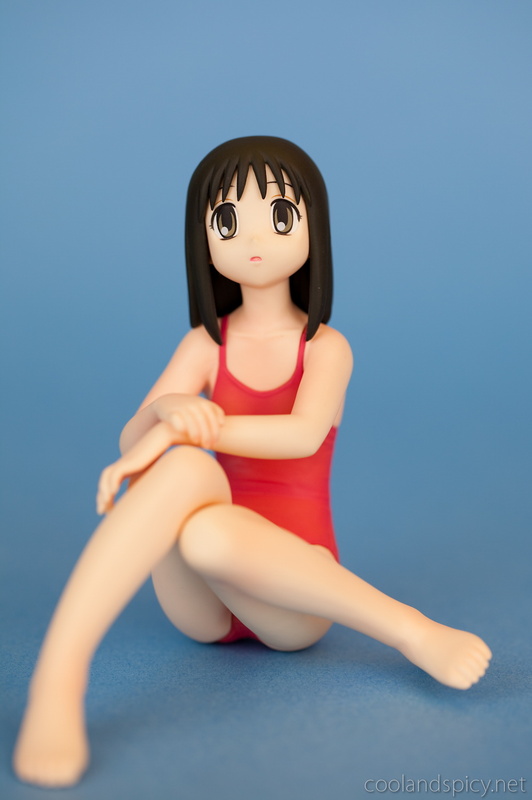 Although these figures are in swimsuits and thus have minimal clothing details, the edges on Sakaki’s bikini is quite rough in some areas, especially on the bottom piece. 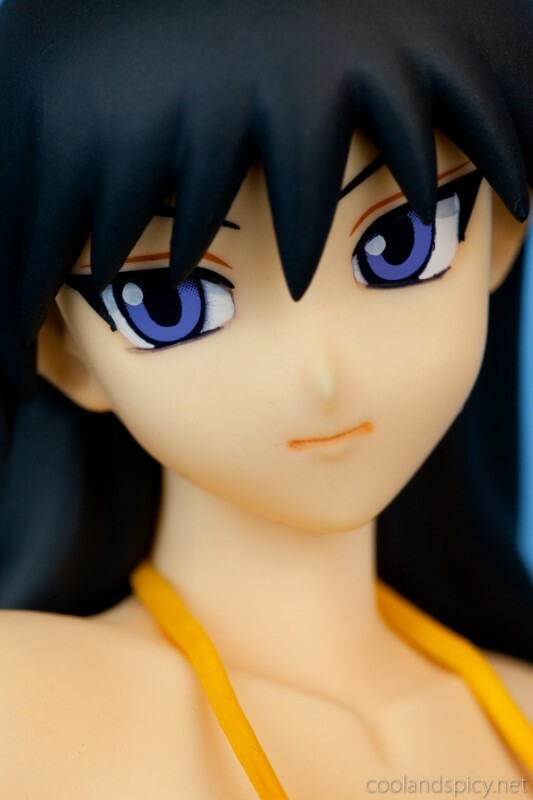 Also, Sakaki’s more skin-exposing suit reveals some flaws in the skin tones. Both of the figures have a very white skin tone, which certainly could have been the desired look, but some parts of Sakaki’s skin looks a bit rough, almost as if it were scuffed. Also, Sakaki’s hair design is extremely simplistic (overly so). 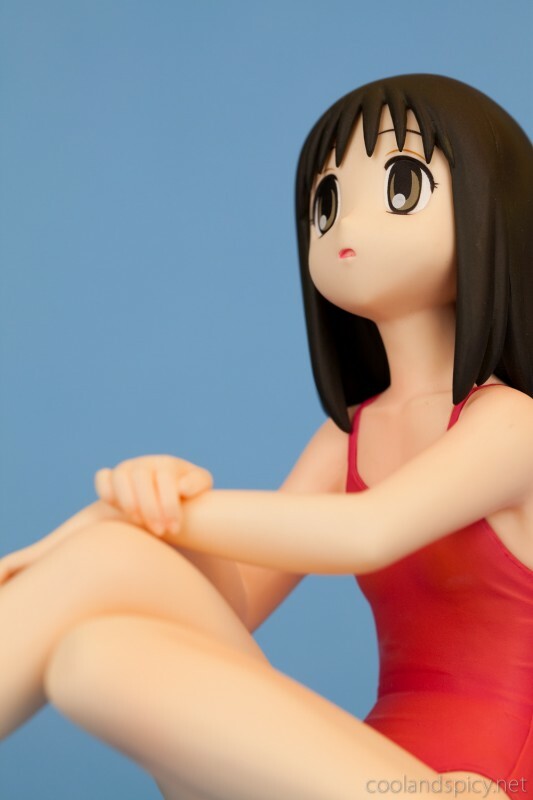 Don’t get me wrong, these figures are not horrible, they’re just not high quality ^^; And seeing as how there’s not many Azumanga Daioh figures around, they’re still a bit unique. Plus, they were pretty cheap! Scored Osaka for 3,840 yen and Sakaki for 4,650 from Amiami. If you like Azumanga, you want want to pick them up. Kotobukiya is releasing Kagura soon and I’m betting more of the Azu girls will follow. Speaking of Azumanga, I still need to read the new parts Azuma wrote for the anniversary edition. And I still need to pick up Yotsubato! vol. 9. Love that series ^^. Maybe I should get one of the Revoltech Yotsuba action figures? Hmm…So it turned out as I expected from the promo shots.I always thought that the girls looked rather “simple” and reminded me about figures from a few years ago regarding paintjob and sculpt quality. Tomo and Osaka were my favorites. Tomo for her stupid, energetic personality and Osaka for just being stupid (and funny). They are very simple in design, but do have a nice look to them. I like the angles on your shots and the closeups. .-= bluedrakon´s last post… Blog Review: It’s Finally Anime =-. Yotsuba >>>>> Azumanga Daoih for me. .-= lovelyduckie´s last post… Last Week’s Haul =-. I’m more for Sakaki, because I remember getting a little freaked out by Osaka. Some of the stuff she said and saw… She be trippin’ real high. 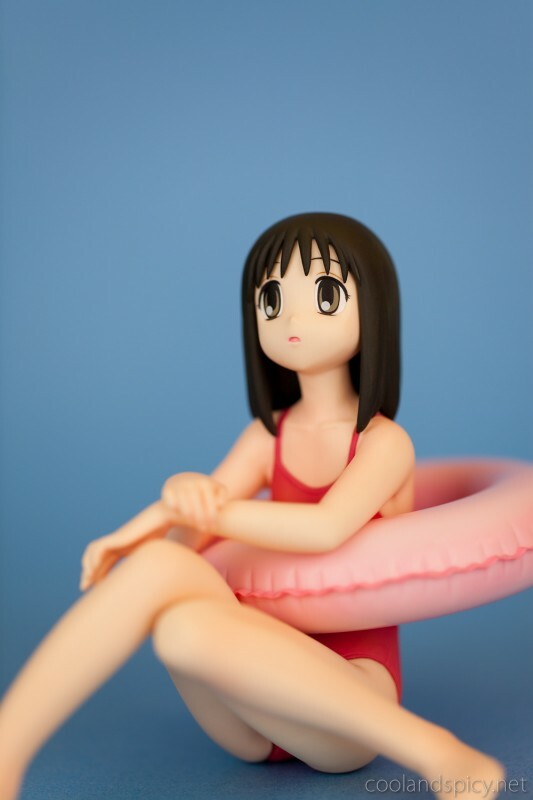 Adored “Azumanga Daioh”, such a classic anime. Should grab it on value DVD sometime. It is indeed a timeless classic and a scomedies go a must watch for all. Perhaps one of the first token slice-of-life/school comedy (without romance)? When young fans raved about “Lucky Star” and its concept, did they realize it probably got its genre inspiration from Azumanga? These figures look alright but not that convincing, Sasaki’s expression isn’t much to my liking. Will pass on these. 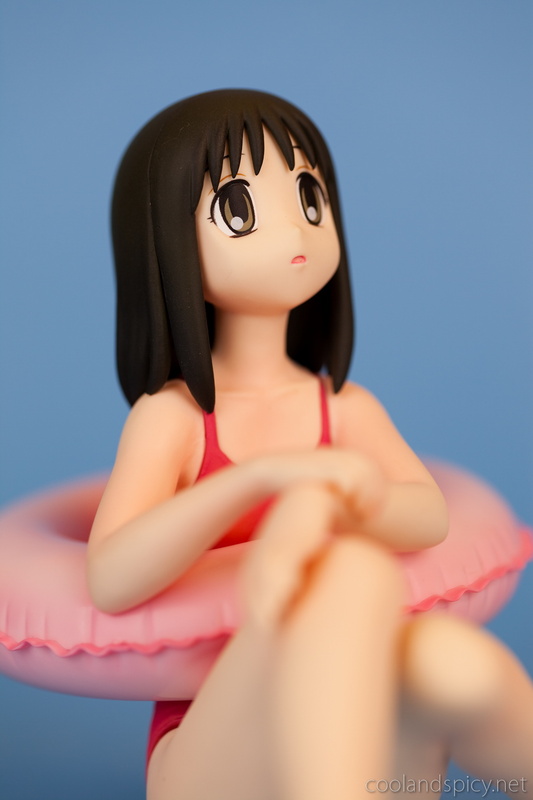 .-= Smithy´s last post… Alter Akiyama Mio figure review =-. Yeah, the eyes aren’t the best quality but the photos where they look bad are the close-up macro shots. They don’t look so bad from a normal viewing distance. Ah! I totally forgot about poor Osaka, she was on my to get list. She looks quite simple and nice.